Sometimes it’s a majestic vista. Sometimes it’s a simple throw pillow. Opportunities to fall in love with color, shapes and styles—and infuse them into the look of your wedding—are all around you. 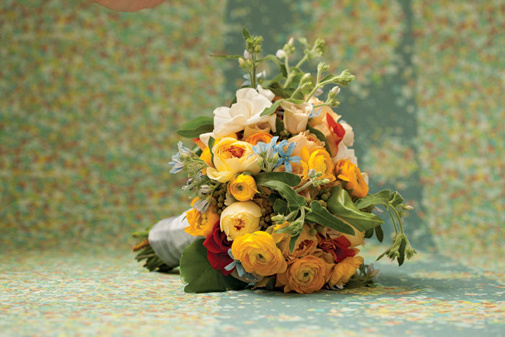 After watching bold, bright floral patterns take over fashion runways, we asked our florists to turn striking blooming prints from Northeast Portland’s Bolt Fabric Boutique into vibrant bouquets. The results are gorgeously unique and altogether inspiring. Where will you find yours? (above) This garden-fresh bundle of ranunculus, roses and gardenias is an eclectic portrayal of the Nani Iro Basics print from Kokka. The impressionistic pattern recalls the luminous paintings of Art Deco artist Maxfield Parrish, and North Portland’s Emerald Petals created an exuberant bouquet with elegant silver ribbon wrap that evokes the simplicity of the 1930s with all the energy of today. Gardenias, tweedia, ranunculus, bird’s nest fern, berzelia, roses (caramel antike, metallina and leonidas); $225. 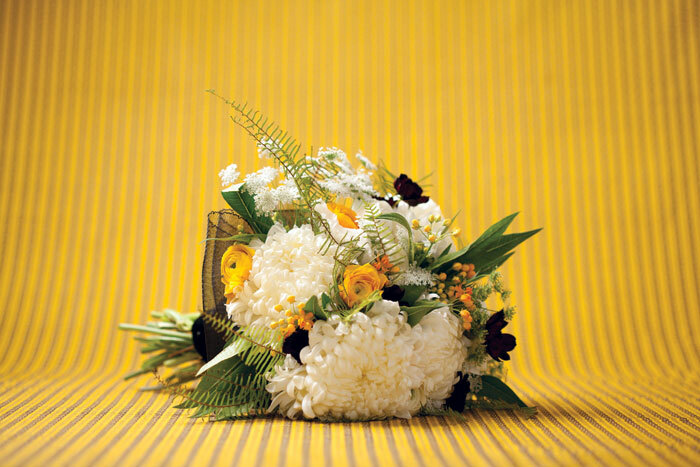 (above) Bloomsberry Floral in Southeast Portland paired breathtaking white blooms with pops of yellow and winks of brown for a modern take on the classic ivory bridal bouquet. The colors echo the old-fashioned folk print of miniature blooms in graphic stripes on the Shelburne Calico Garden print by Windham Fabrics. A luxe black velvet ribbon with a netted accent gives this collection a hint of 1940s charm. Ranunculus, chocolate cosmos, asclepias, lisianthus, Queen Anne’s lace, standard chrysanthemums, Australian sea star fern; $145. (above) One look at this striking arrangement by Northeast Portland’s Fleur:ology is enough to set any bride’s heart afire. 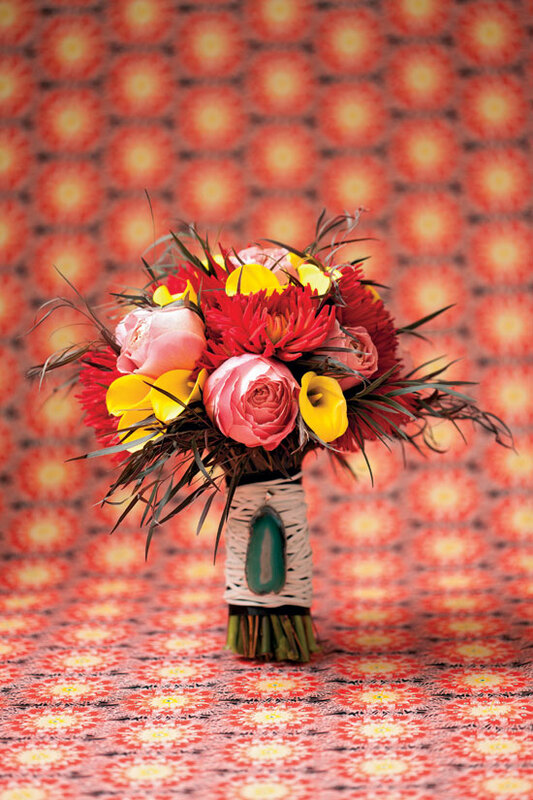 Spiky dahlias and smooth calla lilies playfully mix and mingle, while a turquoise agate pendant against a white, faux-suede strip wrap sets off the vivid red, orange, yellow and aqua tones of the fiery floral bursts throughout the Pom print from Westminster Fibers. Red spider dahlias, yellow mini calla lilies, ‘Romantic Antike’ pink garden roses, dark purple agonis foliage; $225. (above) Using the quaint print from Japan’s Sevenberry as a muse, Eugene’s Sun Blossoms Floral designed this delightful cluster of buds in a sentimental palette of rust, pink and sage to give off a fashionable heirloom vibe. The hand-tied bouquet’s delicate baby spray roses play on the country style and create eye-catching detail in a dynamic array of sizes. 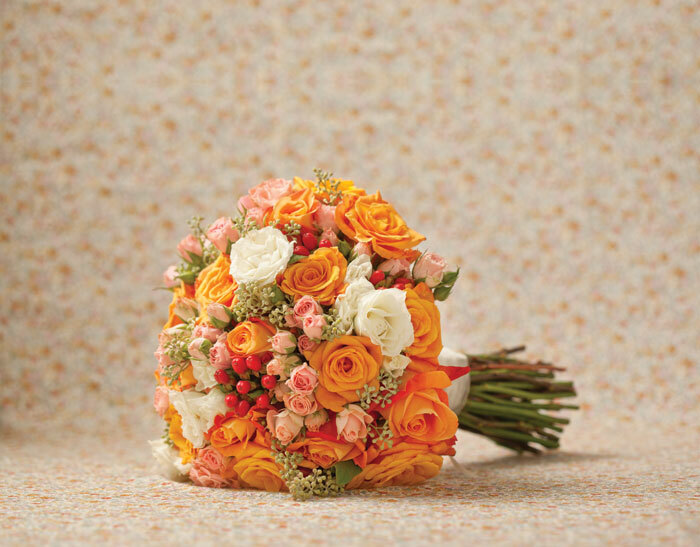 Orange voodoo roses, spray roses, red hypericum, seeded eucalyptus; $150. (above) Swept up in the Lotus and Berries pattern from Westminster Fibers, Botanica Floral Design in Northwest Portland immediately landed on a vintage tropical theme that demands attention, just like this large-scale print. Soft blush and celadon shades in sculptural lines bring on the heat, and a sleek leaf wrap evokes the singular beauty of the jungle. 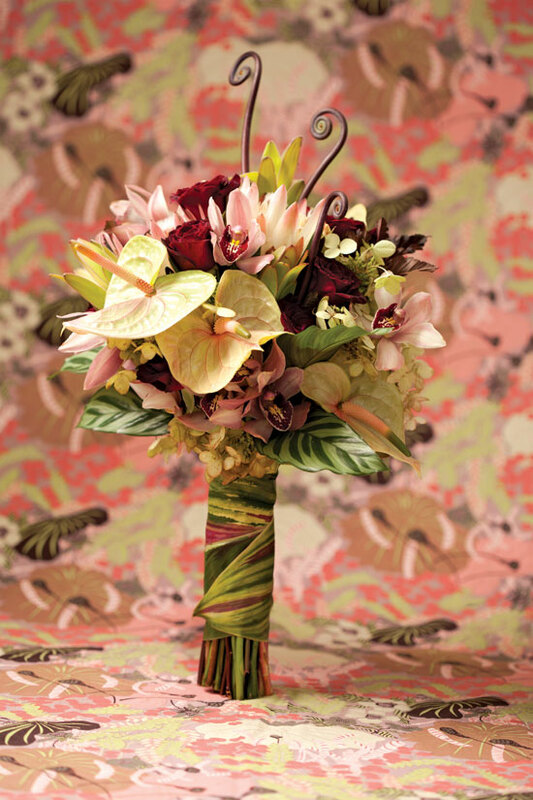 Anthurium, protea, fern curls, hydrangea, black baccara roses, leucadendron, cymbidium orchids, calathea leaves; $175.